No sooner had I put my post about Schoenberg and the harmonium to bed than up popped another harmonium issue. This one is not exactly new to this blog; indeed it was raised back in 2011 when the issue first impinged on my consciousness. (Dr Marc's Blog: Manfred Mysteries) The need to provide a new set of programme notes for the Hong Kong Philharmonic’s upcoming performance of Tchaikovsky’s Manfred Symphony forced me to revisit the issue of how the Symphony ends. There should be no question. 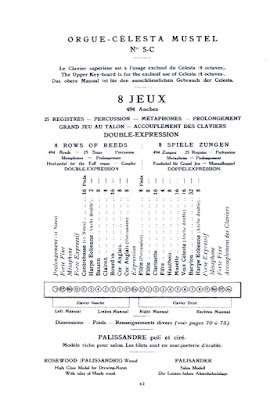 Tchaikovsky’s score instructs a harmonium to join in with the orchestra in measure 448 of the fourth movement, play along with the orchestra for 30 measures, and drop out of the picture as the work fades away to its very quiet ending, representing the death of Manfred. The only problem is, it is never performed that way. Disregarding Tchaikovsky’s explicit instructions, most conductors choose to substitute an orgiastic organ for the humble harmonium, completely transforming Tchaikovsky’s scoring in the interest of what sounds truly spectacular. Indeed, a comment on my earlier post suggested that the entry of the organ, coming in all guns blazing, was the highlight of the entire work. What a shame that the highlight is the one thing Tchaikovsky did not write! When I first heard the work in my early teens I, too, was so bowled over by the dramatic appearance of the organ that the work quickly became a huge favourite. I judged the success of live performances on the impact the organ made at the end, and it was only when I first had to play the part in a concert that I saw that it was not scored for organ at all. My assumption then – as has been, I imagine, that of generations of conductors - was that Tchaikovsky simply did not have an organ to hand when he scored the work for its first performance, and used a harmonium. Surely a simple little squeeze-box like the harmonium could not have been a serious intention against such huge orchestral forces? Michael Barone, in his impressive list of orchestral works involving the organ compiled in 2005 (http://pipedreams.publicradio.org/pdf/organ_orchestra_list_2015.pdf) highlights the organ part of Manfred as one of the few in which “the organ part is significant and prominent but not soloistic”. Since then, though, I have learnt a lot more about Tchaikovsky’s orchestration and realise that he would not have allowed a simple matter like no instrument in the offing to prevent him writing what he wanted. Tchaikovsky has a history of innovative keyboard scoring. He pioneered the use of the celesta (in Nutcracker) fully aware that the instrument was so rare and new that few ballet companies would have been able to get hold of one. Yet he still used it – and actually designed the “Dance of the Sugar Plum Fairy” for its unique sound. Was he not, then, doing something similar with the harmonium? 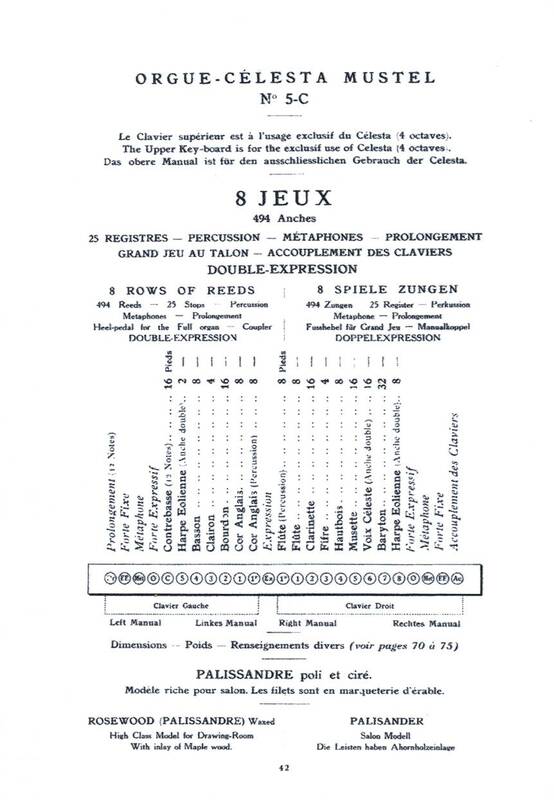 After all this was a relatively new instrument (patented in the early 1840s – the celesta’s patent was taken out in 1886) and was being developed in Paris by the same builder (Mustel) in whose showroom Tchaikovsky first encountered the celesta. Is it not conceivable that Tchaikovsky was as keen to expose in an orchestral canvas another innovative French keyboard instrumental sound? 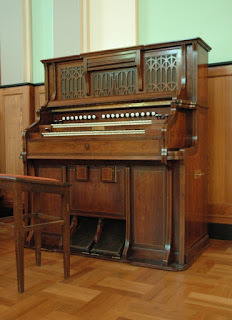 There is a strong connection between the celesta and the harmonium. Mustel, who took out the patent on the celesta, had also refined the harmonium to such an extent that it was a very powerful instrument indeed. My picture shows a 1900 two-manual harmonium which combines the harmonium (bottom manual) with the celesta (top manual), and while this instrument was not available to Tchaikovsky, who composed Manfred in the years 1885 and 1886, he had been in Paris during December 1884 and again in the early part of 1886, and it is possible that he visited Mustel’s workshop at that time and came across both instruments. Certainly he made a point of seeking out Mustel again in 1891 to hear how the celesta had progressed and was so impressed that he immediately decided to write a part for it in the work he was then involved with (Nutcracker). Is it not within the realms of possibility that the same was the case with the Harmonium and Manfred, and that the addition of it was part of a last-minute burst of enthusiasm for a new musical invention? On top of that, Tchaikovsky was actually brought up alongside an early version of the harmonium, known as an orchestrina or organette. This played perforated roles (much as a barrel organ or player piano does) and created a sound by using wind blown over reeds to approximate orchestral instruments. The Tchaikovsky household in Votkinsk possessed one and, according to Alexander Poznansky’s biography of the composer (http://en.tchaikovsky-research.net/pages/Tchaikovsky:_A_Life), “Tchaikovsky's earliest musical impressions came from the family's orchestrina, with its excerpts from Mozart, Rossini, Bellini and Donizetti”. An interest in the latest musical technologies is one thing, but surely a composer who did, to an extent, associated himself with Byron’s Manfred, bringing in something so clearly etched on his childhood memories is another, and I find this coincidence a compelling argument for Tchaikovsky’s deliberate use of the harmonium in the work. I even read that Tchaikovsky had confessed to a liking for the sound of the harmonium; but the statement I unearthed offered no supporting documentation to back this up. 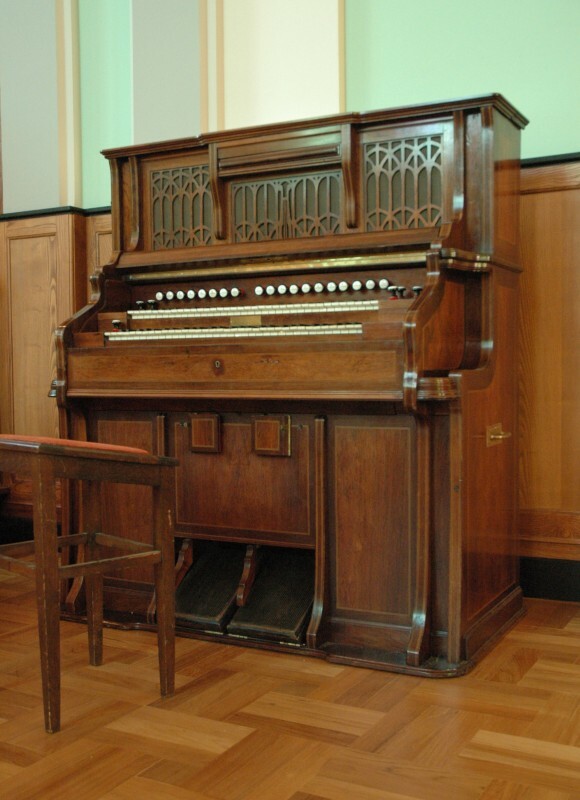 As I wrote in my earlier blog post, when I played the work in Singapore’s Victoria Hall in 1999 with the Malaysian Philharmonic, most of that hall’s horrible little Klais was not working and so the effect was almost harmonium-like: and it worked very well indeed, by all accounts. I have tried, through various electronic methods, to emulate the sound of harmonium against full orchestra and, while my experiments fell far short of the real life sound, I am pretty well convinced that it produces a quality of sound which is, in my opinion, distinct enough to have been appreciated by a master orchestrator such as Tchaikovsky. If only someone would try it out in public; but so far as I know, nobody has (and lived to tell the tale). So, in a world where performers are becoming increasingly conscious of faithfulness to both the letter and the spirit of early music, they happily spit on Tchaikovsky’s grave by ignoring his clear stipulations and deciding that, as an orchestrator, he did not know what he was doing. It does not stop there, unfortunately. As my previous post revealed. The desire of the Soviet Government, as voiced by the infamous Zhdanov, was for music to exude ultimate optimism. Prokofiev’s problem with Romeo and Juliet, where he felt obliged at one stage to change Shakespeare’s ending so that the lovers did not die and the music could end in unabashed joyfulness, is perhaps the best-known example of this. The Soviets were prone to apply their ideologies retrospectively, and it was not uncommon for works which ended quietly or introspectively, to have their endings altered to accord to Soviet ideologies. Such was the case with the Manfred Symphony, where the soft ending, representing Manfred’s death, was politically unacceptable. As happy to rewrite music as history, the Soviets took to cutting out the final bars of the final movement and inserting the final bars of the first movement in order for it to end on a note of unequivocal triumph. A few still do this today, arguing that it was “common practice” in Russia, so therefore it is legitimate to ignore Tchaikovsky's specific intentions. I was interested to read a gentleman by the name of Andrew Condon huffing and puffing about this on Norman Lebrecht’s “Slipped Disc” blog. He accused the conductor Tugan Sokhiev of an act of appalling destruction by using this well-established Soviet-era musical rewrite in a performance of the Manfred with the Berlin Phil in 2014. “Cuts are one thing (e.g. the standard optional cuts in the finale of the Tchaikovsky violin concerto, a cut in the 3rd movement of Rimsky Scheherazade – I think started by Stokowski, but no longer acceptable now) but to cut AND paste as Mr Sokhiev did seems a step too far”. I agree. Cutting and pasting here is outrageous – even if it is accepted practice by Soviet-era conductors. But so is riding roughshod over Tchaikovsky’s own orchestration. Would Mr Condon have been so angered had the organ blasted rather than the first movement’s ending been restated? I suspect not. He hates cuts he hasn’t heard before, he recognises no error in re-orchestrations he has. Arthur Ord-Hume, in his 1986 The Harmonium: The History of the Reed Organ states that no harmoniums “have been manufactured since the 1930s”. Made of wood and leather, the remaining ones are disintegrating fast. Perhaps we need to get someone to build a few more for the concert hall so that we can do full justice to the orchestration genius of Tchaikovsky whenever his Manfred Symphony is wheeled out; otherwise it won’t be ignorance which sees his tone colours overridden but genuine necessity.